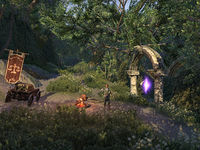 Ebon Sanctum: High Elves are used to magic, so the misdirection spells wreathing the woods of Ebon Stadmont are regarded by the locals as a sort of amusing curiosity. There's talk of an "Ebon Sanctum" hidden somewhere within, but no one really believes in it. 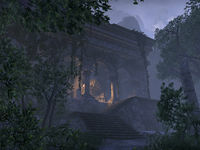 Ebon Stadmont is a mysterious forest found west of Cloudrest. It is on the banks of the cove found between the peninsulas where Alinor and Lillandril are located across. Ebon Stadmont Objective: Help Andewen discover the secrets of Ebon Stadmont. 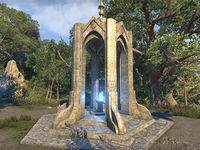 The Ebon Stadmont Wayshrine is located west of the entrance to the forest. Ebon Stadmont previously appeared in Arena.